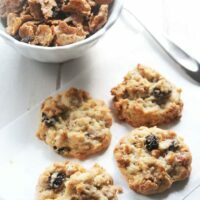 Raisin Bran Crunch Cookies are filled with Raisin Bran Crunch cereal, coconut, and pecans. Wouldn’t you rather eat you cereal in a cookie instead of a bowl? Do you have any weird habits when it comes to your breakfast menu? The way I do breakfast is weird. At least that’s what my husband says. I like to eat the same cereal every morning. For years it was Frosted Flakes. Then one day I woke up and decided I was tired of Frosted Flakes and moved on to something else. Now I eat Fiber One every day, mixed with another cereal so it doesn’t feel like I’m eating only twigs. My current mix-in is Raisin Bran Crunch. Love that stuff. Avert your eyes from the nutrition label on the box for maximum enjoyment. A few weeks ago, I made some carrot cookies from Dorie Greenspan’s Baking cookbook. I was pleasantly surprised as they reminded me of one of my all-time favorites–Ranger Cookies. Since I already eat enough carrots to turn my skin orange, I decided to replace the carrots with Raisin Bran Crunch. They turned out as yummy as I anticipated. My husband loved them too. Hot out of the oven they have the texture of a scone–soft on the inside, crispy on the outside. Wait until the next day when the flavors settle in and get comfy. The result will be a soft but chewy cookie. These are so good, I’m thinking of giving up Fiber One and just putting 2 or 3 of these cookies in a cereal bowl and calling it breakfast. 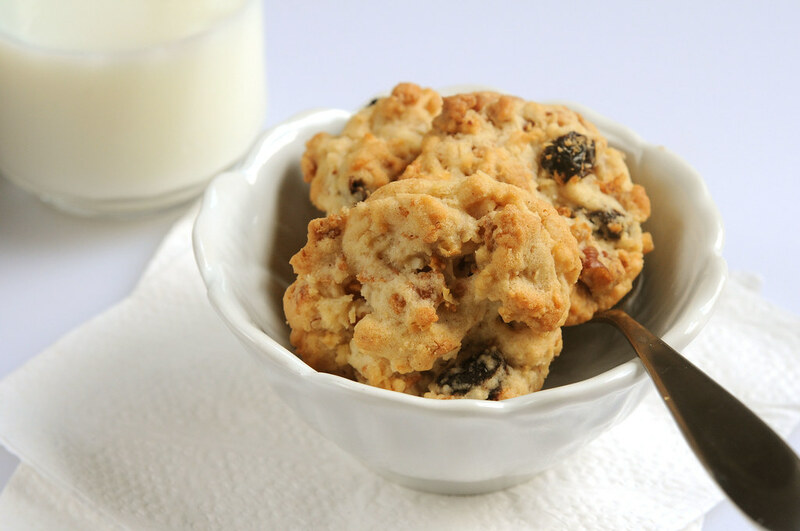 Slightly crispy on the outside, soft and chewy on the inside, these cookies are filled with Raisin Bran Crunch cereal, coconut, and pecans. Preheat oven to 375 degrees F. Line two baking sheets with baking mat or parchment paper. Whisk together first four ingredients. Use mixer to beat butter until creamy and smooth. Add sugars and beat 2 more minutes. Add egg and keep beating for additional minute. Reduce mixer speed and add vanilla. Add dry ingredients in 2 portions incorporating into dough just until mixed. Add cereal, coconut, raisins and pecans. 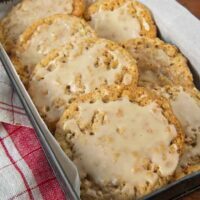 Drop cookies by generous spoonfuls onto prepared cookie sheets. They won't spread much so can be placed fairly close together. Bake for 16-18 minutes. Rearrange trays halfway through to facilitate even cooking. Allow to cool on rack. Fun sugar cookies fancy enough for a celebration or party. No decorating skills required. 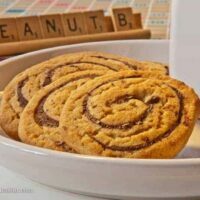 Chocolate-Peanut Butter Pinwheels combine peanut butter dough with a layer of melted chocolate, which are then rolled into a jellyroll shape before slicing. I love raisin bran its my favorite cereal. This recipe sounds great i definitely am going to try them thank you for the recipe! I am going to look through your other recipes! 🙂 thanks again! At the,moent, I’m a fan if apple cinnamin chex mixed with raisin bran crunch. Fruity Cheerios and chex is also yummy. A store called save-a-lot has their brand of granola and raisin cereal. Its awesome dry, by itself and it doesn’t have an, overwhelming coconut flavor/after-taste that some,granola cereals have . Raisins naturally contain high levels of fructose. In addition, to prevent clumping many manufacturers add sugar to the raisins; as of January 7, 2010, Kellogg’s adds high-fructose corn syrup to its Raisin Bran cereal. 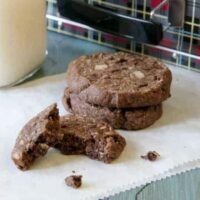 My son came home from college yesterday and just happened to ask me to bake these cookies for him–he said they’re the best cookies he’s ever eaten! Actually, we did it together(he loves to cook) and we tweaked it a bit–added a bit of nutmeg, some cinnamon mini-chips, a handful of craisins. We also soaked the raisins/craisins in some water with a little rum added. 😉 I’ve also made them with cut up dried apricots and chopped dates. These sound delicious! Holy yum! Mmm, the cookies look great! I recently got some Raisin Bran that had extra things in it that I really liked called Raisin Bran Extra. I really liked the cereal and kept putting it on top of my yogurt and granola. Wow this recipe looks amazing! I’d love to try it out! Do you offer nutrition facts for your recipes? My favorite cereal right now is Kashi Go Lean Crunch – Honey Almond Flax. It is basically cruuuuunchy chunks of granola lightly sweetened. It is SO good! These remind me of raisin bran muffins my grandmother made me when I was a child. Your cookies look great. Those look great! My kids don’t like raisins at all, so this might be one just for the adults. Excelent blog, very creative… keep up the good work. I will see what can I cook from here! 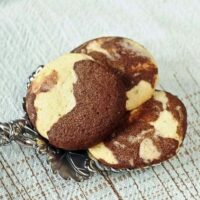 Your cookies look intriguing, but wow, I want to try those beautiful Moonstone cookies first! Wish we had Trader Joe’s in the Dallas-Ft. Worth area. I’m with you- these would be a great breakfast! I love raisins and Raisin Bran, so these sound great. I eat Quaker Crunchy Corn Bran just about every morning (and my husband thinks I’m weird). I like it dry or with milk and it’s really low in calories and high in fiber. And I think it’s tasty! I love Quaker Crunch Corn Bran too. Haven’t had it in a long time. Thanks for reminding me. I too love cereal for breakfast. I’ve really been enjoying GrapeNut Flakes lately. Crunchy and slightly sweet, with a great taste. They do get soggy quick (which I don’t like), but as long as I don’t let them sit, it’s okay. I just found your blog today, and I’ve had a great time looking at your recipes. Amber, I’m not familiar with the flakes. Will definitely give them a try. These sound good to me. I’m the only one in my house who is a raisin fan. And it’s weird, I don’t like cereal for breakfast…only as a snack.